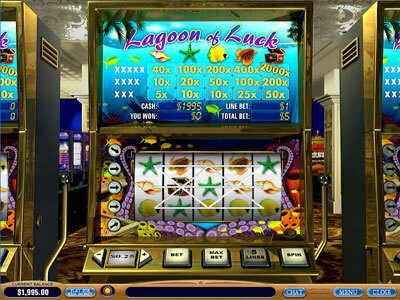 The object of Lagoon of Luck is to obtain a winning symbol combination by spinning the reels. · Select the lines you want to bet on by clicking on the arrowheads left of the reels. To unselect a line, click the arrowhead again. Click 5 Lines to select all five paylines. · Choose the value of the coins you wish to wager each round, by clicking the + and – buttons on the left of the screen. · Click Bet or Max Bet to select the number of coins you wish to wager. Each click on the Bet button increases your bet by the value of the coin you selected. Pressing Max Bet will increase your bet to the maximum amount possible – that is four coins (or less, if you do not have enough balance) – and spin the reels automatically. Remember that the total bet (that is, the sum exracted from your credit) is line bet multiplied by the number of lines selected. · If the reels show a winning combination after they stop (along a payline you bet on), you win according to the winning table (see the top panel of the machine). If you win on multiple paylines simultaneously, your winnings are added up. The paylines are represented by lines that appear only when activated. You will see the shape of each individual line by activating the lines one by one by pressing the Bet One button. Please note: a winning symbol combination must occur on an activated payline (a payline you have placed a bet on) for you to win! The tables show a certain number for every hit amount for every symbol. If you have four symbols in a row starting on the leftmost reel (that is four hits), read the number on the line “XXXX” and in the column under that symbol. Multiply your line bet by that number and you get the winning amount. If you have winning combinations on multiple lines, add them all up to get the winning amount. The symbols have to lie consequtively, starting from the leftmost reel, to qualify as hits.